COULD there be an election looming across the border? Back. Belinda Ingram (V-Pres), Rosanna Burston (Sec. ), Pam Padovan (Tres.) and Karen Hall (Committee). Front. Tim Overall (Mayor), The Hon John Barilaro and Barry Cranston (Pres) at the Trinculo Place cottage. 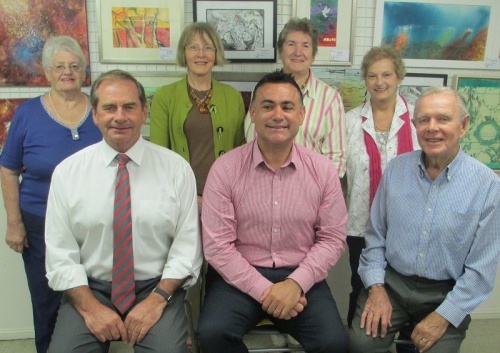 News is to hand that the Queanbeyan Art Society has been granted $40,000 as a NSW Government grant to double the size of its working gallery in Trinculo Place under the bridge and to extend the pergola area. In spite of extensions to the rear of the little cottage occupied by the popular society, the main gallery has often been closed when there are workshops on because they take over the main gallery. The society regularity has six major workshops and a working class every second Sunday. President of QAS, Barry Cranston, is naturally thrilled at the news and told Citynews that the extra space would give more room for the monthly art exhibitions.